Today Logan is having a two-year-old day. A day where he wants chocolate milk for breakfast, demands to watch tv shows that don't exist, throws a huge fit with each article of clothing I try to put on him, then runs out into the pouring rain and jumps into puddles the second I open the garage door. Today I am having a pregnancy day. A day where I also only want chocolate milk for breakfast, cry listening to music from glee (they have great voices but covers of justin bieber and katy perry don't usually do it for me), get frustrated easily at dumb things, and will do anything to get out of the house to run one of those meaningless errands that I used to have the energy to do all the time. I haven't left the house for anything not church related since Friday. So after changing Logan's clothes again from being soaked in the rain and bribing him with m&m's to get in the car we went to Joann's. One of the worst places to take a child after the post office and the bank. Actually those two are way worse but today Joann's was the torture of the day. After steering the cart into several secret corners to hide my screaming child while I shamelessly continued to bribe him to be good (terrible parenting, but usually works in a pinch) I finally let him run free. And run free he did. After pulling on every shiny bauble he saw, throwing pots on the floor, screaming at the top of his lungs, and racing into the restricted framing area we were done. We got to the car (empty handed) and I made him repeat after me several times "I will not run away from mom in the store" while I took a picture of someone who is probably having a worse day than me. We've had a lot of rain today. I don't even know where I'm going with this story anymore but I'm going to keep writing . So I was upset and frustrated (and crying, I know) when I got home and I just wanted to get away. Luckily Tyson was just getting home for his lunch break when I pulled up so he took Logan out of the car for me and I drove away. You know, after telling Tyson I needed a break. I didn't just peel away like the crazy person that I am inside. What does a pregnant woman do when suddenly presented with almost an hour of alone time? I picked up a couple of beef supreme chalupas and with the smell of (probably) fake meat and fried bread in the car I drove to the nearest Goodwill where I shamelessly ate 500 calories of sour cream in their parking lot. In the rain. Listening to soft rock. I took a swig from Logan's sippy cup, remembering too late that it was laced with mirilax, but I figured it was nothing that a little pregnancy couldn't equal out. And then I went inside and found myself a cute Target maternity sweater for $7. And that was all I needed. A moment to be myself so I could come home and be a better mom. So I could appreciate the good in my little boy and keep the naughtiness from making me upset. So I could be reminded again of what an amazing and understanding husband I have. So I could have Taco Bell again. My kids freak out in Joanns every single time. Too much stimulation? I don't know, but it drives me crazy! Congrats again on baby! I'm so excited for and Tyson. i LOVE reading your blog Mari! Ah- the truth of motherhood! It's a good thing they are pretty dang cute, and we love them so much! Congrats on the new babe! You are the cutest mom ever! Awesome story. I love it when people are cool and don't try to sugar coat their lives. P.S. You made me want taco bell. And it's 5 am. Everybody has bad days and I know you have been rained on for a long time. Go in the house and turn on all the lights and dance! Bah ha ha!!! I was dying at this!! Totally been there. I love that you stopped to take a picture of someone having a worse day! Classic! Taco Bell does the same thing for me when I am pregnant! 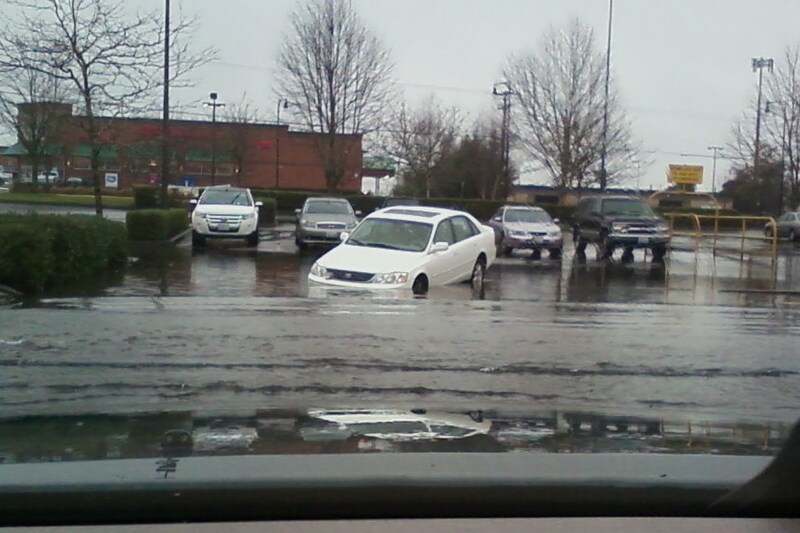 Funny thing--a lady in my ward took a picture of that SAME CAR in that parking lot and posted it on facebook. Hahaha. Poor whoever owns that car. You are such a good mom Mari! Sorry it was such a hard day, hang in there! Love this post! I always love reading your blogs. They brighten my day. Never stop writing!!! Sometimes it's nice to know others have days like this too! I just laughed really hard-- hope the after effects of the Miralax didn't make for an even worse day.